Asian regional newspapers are cautiously welcoming Burma's decision to release democracy leader Aung San Suu Kyi, with many taking the line that it is a small step in the right direction. Some voices in the Indian and Chinese press defend the policy of non-interference in Burma's affairs and the pursuit of trade as the best channels to encourage Burma to open up. Many commentators are guarded in their optimism about Ms Suu Kyi's ability to bring about change in Burma, saying the challenge of uniting pro-democracy opposition forces will be enormous. No one can predict whether Suu Kyi will be under house arrest again in future, but if the world keeps using trade and assistance to encourage the country to open up, it might enable this country to finally embark on the road of reform and opening up... Ms Aung San Suu Kyi and the Burmese people will find a new path together with the authorities. Much as some may find the junta to be needlessly obstinate and its "persecution" of Daw Aung San Suu Kyi obnoxious, it must be conceded that Burma's rulers were firm in deciding what was in the best interest of their nation. Just as bringing about regime change cannot be the moral obligation of any one country, interference in the domestic affairs of a nation must not be seen as a presumed right by anybody. 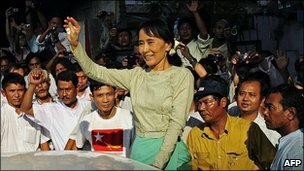 Suu Kyi's release, her public offer to talk to the government and the signs she has shown of softening on the sanctions - she had supported them for a number of years - provide an opportunity to pursue democratic reform while ending Myanmar's [Burma's] diplomatic isolation and economic stagnation. New Delhi must play its part in this by encouraging and facilitating talks between Suu Kyi and the government. It would be unrealistic to expect New Delhi to align with the West against the government as it has been exhorted to do. The truth is there's a small body of Indians who feel dismayed, even betrayed, by the way our governments have turned their back on Aung San Suu Kyi and the struggle for democracy in Burma... But, sadly, our pleas have fallen on deaf ears. The Congress and the BJP [main government and opposition political parties, respectively] have remained impervious to our exhortations. Nothing has changed. It is pivotal that Suu Kyi and her opposition colleagues must map out long-term strategies to counter the regime's move. The international community will watch her closely. The junta's release of Aung San Suu Kyi is simply to curry favour… it must be held accountable for tough questions such as stealing last week's election and for getting into the nuclear arms business with North Korea. The generals have both the power to kill democracy and the opportunity to let it live. One can only hope that as the old generals fade away the new guard will set in motion steps to dismantle military rule, restore it to the civilians and return to the barracks. The election introduced not a seismic shift, but a degree of structural change... [Suu Kyi's] challenges now include unifying pro-democracy opposition parties and factions and possibly mustering a mass movement as a moral force for democracy, outside the political party system. While the regime is odious, Burma is stuck with it and the West should maintain a dialogue with the dictators, if only to discourage them from locking up Ms Suu Ki again. Despite being a national hero, she lacks the political resources to challenge the regime. Suu Kyi has still a long way to go before being able to lead a democratic Burma. In this case, Burma is not alone. Indonesia, South Africa and South Korea also had to wait for decades before having democracy. For the junta, it is important that it follow up on the democracy leader's release with moves to engage with her on political change in Myanmar. If it believes Aung San Suu Kyi has now been rendered ineffective, it will be making a mistake. The spirited manner in which her freedom was welcomed in global capitals is a patent demonstration of how indispensable she remains to the future of Myanmar.